Breathes, naps, and barks just like a real pup, so long as you don’t get a defective one. Another toy that is not only interactive but expressive, this toy pup closes and opens his eyes sleepily when scratched on the head, breathes and snores when napping on his side, and barks greetings when his nose is rubbed. We understand why so many kids feel in love when they first saw the commercial. As excited as many kids have been about this little pup, we find ourselves less than stoked due to the toy’s questionable quality. While complaints are always going to crop up, the frequency has been much greater than usual for this toy, so we recommend testing the toy upon purchase to make sure it works. Since a number of toys break down after only a week of use, we also ask that buyers be prepared with a backup toy option in the case this one bites the dust. We explain more about the defects below, in Observations. Interactive puppy playset includes puppy, milk bottle, adoption certificate, and instruction manual. Requires 4 AAA batteries and a Phillips screwdriver for battery installation. Batteries are installed in both back paws, 2 batteries in each paw. The main feature of this puppy is its snuggling actions. It wiggles and moves when being held, like its trying to get comfy. It responds to being fed with the milk bottle by making slurping noises and a burb. It goes to sleep when laid on its side or back, including the sides moving up and down to simulate breathing. It responds to having its belly and head scratched by opening and closing its eyes while making happy sounds. A very cute puppy, indeed. Getting the pup out of the box is a process. There are a large number of twist-ties and plastic do-dads holding it in, so don’t expect to just pop it out and start playing. Once out, there will be a switch on the left back paw (if you’re facing the pup’s front) that moves to Try Me, On, and Off. Try Me is the in-store demo, and is limited in the number of movements and sounds it will makes. Pop that switch over to On and see what all the pup can do. The major appeal of this toy is its cute factor. When laid on its side or back, the belly will rise and fall like it’s breathing while the pup makes little noises, including a bit of snoring. Feed the pup with the included bottle to hear slurping and burps, or pet it to watch it close its eyes and seem really quite content with itself. 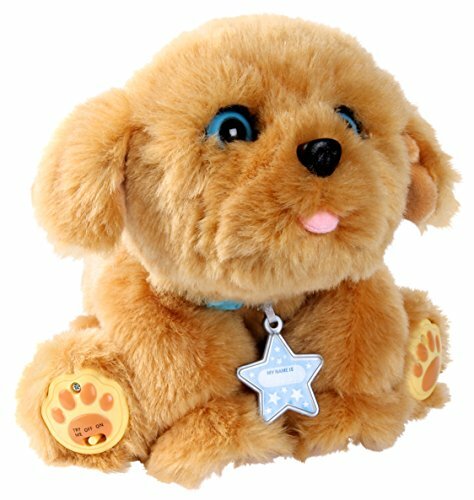 The toy does not walk, but its legs can be moved like a stuffed animal. 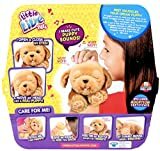 The toy doesn’t respond to commands or sounds, so shouting “roll over” or “sit” will do nothing. In fact, the toy doesn’t do much else than make noises and breathe. Like a real pup, it doesn’t speak, doesn’t tell kids how much it loves them, or anything like that. Some kids may get bored of this toy after a while, especially those kids who expect the toy to be more interacitve. These are not corrected when new batteries are installed. A warning label on the toy requests that any defects be addressed to the manufacturer, Moose Toys, instead of being returned to the store where it was purchased. Ignore this label. If the toy is not working correctly, return it to the store, just like you would with anything else. According to users, Moose Toys is not responding quickly to complaints, and sometimes not responding at all. For more information on how to clean all sorts of toys, check out our Cleaning Guide for Toys. Includes puppy, milk bottle, adoption certificate, and instruction manual. 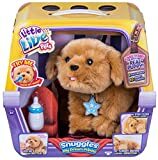 This review is for the golden retriever, Snuggles. There is also Tiara, a white, fluffy pup, and Ruffles, the schnauzer. We have not gotten to review Tiara or Ruffles, and do not know if they are as prone to defects as Snuggles. A number of pups have been reported as defective. Some fail to work properly upon purchase, while others break down a week after first use. We worry about the apparent lack of quality, and feel that more time should have been spent testing the product before production. We highly recommend removing the toy from the package and testing to make sure it works before giving to a child to help avoid upset. Snuggles is the no mess pup who loves to be loved! 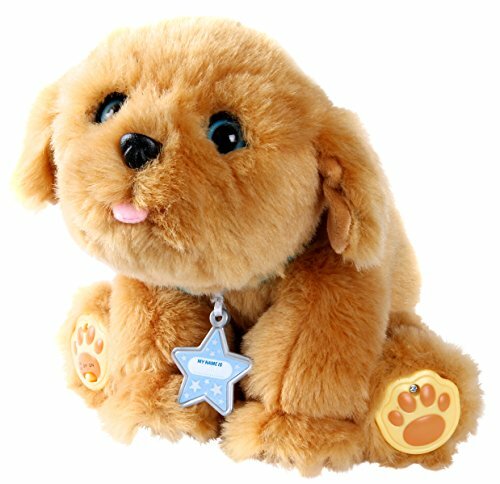 Snuggles moves, feels and responds just like a real pupppy does. With a pat of the head or a rub of the tummy, Snuggles behaves in different ways. 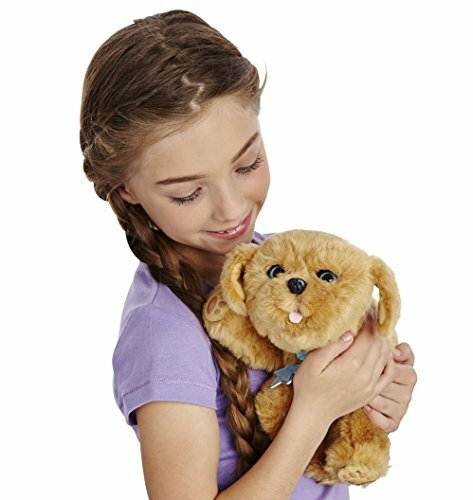 Realistic and fully interactive, all Snuggles needs is a best friend like you!